Had recently bought a basket from the dollar store for our rubber bands. Noticed an unopened package of colorful rubber bands. Mixed them into the bland-colored ones. At a Fourth of July parade. A brigade of Minis drives by. One had these hilarious signs on his car. No, it’s not about Brexit. It’s about us fierce rebel Americans deciding we were better off without colonial overlords. Concluding a meeting at a historic house. There’s a front garden. I wander towards the sound of splashing water. There are dinosaurs in the fountain. Shouldn’t all fountains have dinosaurs? Thank you God for the little things that make life so interesting. Those little things that bring laughter at unexpected moments. Thanks to an astute coworker for this great video, timely as we have a windstorm in progress here in western Washington. Has Leap Day William visited you yet this February 29th? I wasn’t sure if he knew what time my workplace closed so donned a blue coat, bought a blue plastic fedora, added a jaunty yellow paper band to it, and spent the afternoon at various locations handing out candy. Yes, I assumed the role of Leap Day William for a time, and one person knew who I was, so it was a success. “Who is Leap Day William?” you ask. Groundhog Day has… a groundhog. And Bill Murray. The Fourth of July has Uncle Sam. There’s the Easter Bunny, Santa Claus, the Tooth Fairy, the Great Pumpkin, and a host of mythological (?) characters that show up throughout the year. While you might not have been raised with the idea of a sharply dressed man in blue and yellow popping up on February 29th, there is also a Leap Day William. William’s origins are explained in this Atlas Obscura piece, ’30 Rock’ Co-Creator Tells The Story Behind Leap Day William. 30 Rock was a TV show that ran on NBC for about seven years and William made his debut on that. Fun fact: he lives in the Mariana Trench and only comes out on Leap Day. For the uninitiated—someone who is not a 30 Rock superfan—Leap Day William is the keystone of a leap year tradition, where you wear blue and yellow; you stand around and pretend to cry so Leap Day William showers you with sweets (“He emerges every four years to trade children’s tears for candy”); if you see someone not wearing yellow and blue, you are entitled to shout, “Poke your eyes, pull your hair, you forgot what clothes to wear,” and poke and pull. To some Leap Day is a magical day, an extra day, on which you can do daring and glorious things. To others it means doing whatever you want because your actions don’t count. I was also informed that women can propose to men on this day (which led to interesting discussions about a movie I haven’t seen, curiosity about which women would actually do it, and a group text gone hilariously wrong). For me, today was about blowing off the stressful, annoying, and distracting things that try to muddy our workday and trying to bring a ray of blue and yellow sunshine into the daily grind. Whether it scared children, infringed on some NBC trademark, or began an annual– well, every four year– tradition, it was good to be counterfeit Leap Year William for a time. For some it’s been so long since the Easter Bunny or Publisher’s Clearinghouse visited that perhaps it added a touch of childlike wonder to their day. Or now they need therapy. But at least they have candy. P.S. If someone finds the yellow paper hat band I MacGyvered together at lunch with scrap paper, a Leatherman tool, and adhesive material from a book of stamps, no, it’s not a failed attempt at a Mobius strip. I actually know how to make those. Unfortunately, when a pet goes missing, the perception that it’s a bona fide family member doesn’t hold up. When a child disappears, the community throws all its resources into bringing him or her safely home. When a beloved dog or cat disappears, it’s just that: LOST DOG, two words on a poster that most people won’t even notice. Somebody ought to train a search dog to find lost pets, I thought. Guess which somebody it turned out to be . . .
Do you love animals? Are you a dog parent/owner? Do you work in the criminal justice or psychology fields? Have you ever wondered what your dog or cat is truly capable of? If you answered yes to any of these questions, then you are among the many who will be blessed by this fascinating foray into the life of a woman whose dogged determination– pun intended– led her to a career as a pet detective. Kat Albrecht is one woman you should never say “that can’t be done” to. Years ago I became aware of Kat’s work finding missing pets and have referred concerned pet owners to her Missing Pet Partnership website and Pet Detective Blog. Kat offers Lost Pet Recovery training on her website at Katalbrecht.com and has an informative Facebook page. Additionally, Kat’s Mercy Paws ministry trains teens in her field of expertise and helps them discover their life’s purpose through service and love for God’s creatures. Her journey from disillusioned dispatcher to passionate police officer to preeminent pet detective can and should inspire others to fight for their dreams. A major theme in Pet Tracker is finding your true calling and leaving behind the soul-sucking jobs that cage your talents and authentic self. So how does a woman named Kat become an expert on search dogs? Kat began her career as a law enforcement employee in the not too distant past. Simply by virtue of her gender she ran smack into the brick wall of sexism so prominent in policing at the time (and still present in all too many agencies today). As a young, female go-getter, the male-dominated culture in her agency found her work ethic, innovative methods, and intelligence threatening. She was told to do menial “female” tasks and harassed, like when trying to build rapport with victims and suspects. Kat was forced to confront pervasive stereotypes and bias in the policing profession as she worked hard to show that she was not only a capable cop, but one with particular gifts. On this point, as a former civilian law enforcement employee, I identify with Kat’s struggles. I joined policing later that same decade and was appalled that female employees, particularly civilian ones, were more highly regarded when they acted perky, giggled a lot, and made coffee, in my words at the time. Being sexually available to certain figures was sure to score major prom queen points and a prominent place on the popularity ladder as well. I also remember the department-wide shock wave caused when I used the words “crappy report writing” about an officer’s narrative and it was overheard; you’d think I’d threatened the life of the president. It became clear that as a female– and a civilian– I was stepping outside my tiny culturally-defined box. They could say it, but I didn’t have the same freedoms. I learned, as Kat did, that being an intelligent female who challenges the status quo by trying to improve processes and procedures was often met with hate and derision. This was especially true for Kat as a sworn police officer because she was working in a traditionally male role alongside men who didn’t want her there. Furthermore, Kat stepped WAY out of her box when she suggested that her agency utilize trained search dogs for their work. Kat wanted to be a K9 officer but again– gasp– she was female, and police dogs weren’t trained to perform the tasks she had started teaching her own dogs to do. Her department told her not to use a trained bloodhound to search for a missing girl. Even in a volunteer capacity, police departments were not receptive to the idea of using trained dogs to save lives, enhance public safety, and recover victims. Full-fledged Officer Albrecht was actually told to go work elsewhere if she wanted to work with a bloodhound! This barrier is also familiar to me– law enforcement agencies sometimes feel threatened by outside help. They might believe they’ll do better without a pet detective or forensic psychologist or behavioral expert even though cops don’t usually have such training. Some also tend to do things the way they’ve always been done rather than act in the best interest of the public they’re sworn to protect. While I know many open-minded, intelligent, and creative minds in the business, there are also those, particularly those in charge, who are set in their ways and feel that change undermines their authority. They may seem attempts at positive change as insubordination or subversion. In retrospect, Kat realized that “my passion for working search dogs was viewed as arrogance.” She just wanted to help. So she began to plan how she could develop her passion for working with her dogs instead of how to adapt to a police department that was never going to let her– or her dogs– do what they were best at. The time and effort she put into discovering her dogs’ individual gifts– aided by a very gifted and patient cat– is nothing short of remarkable. With her dogs at her side she took what she learned in law enforcement and translated that into pet detective work– while continuing her career as a law enforcement officer at another agency who welcomed their skills (having had people at the same agency, I appreciate its open-mindedness). This much-needed positive change came about as she renewed her relationship with God and started seeking His way instead of her own. Woven into Pet Tracker is the discipline of learning to hear from God and trusting Him. As Kat can attest to, even when your own plans seem perfect, He sometimes has a better way. And literally stop her in her tracks a couple of times He did. It was when her own police bloodhound went missing that Kat realized just how much of a need there is for canines trained to find pets. A volunteer dog located her beloved partner but that dog was one of very few conditioned to do so. As she points out, police dogs are trained to ignore other animals, not find them, so the average K9 officer can’t do this. She noted striking similarities between lost people and lost pet cases and built upon that, founding the National Center for Missing Pets on the way. Then life threw her another curve ball with a life-changing freak injury suffered as a cop but even then she found ways to continue and expand her mission. Pet Tracker also runs the gamut of emotions and it details Kat’s relationships with her original search dogs and feline assistants including their aging and loss. I felt the latter deeply because I read the book less than a week before unexpectedly losing my own copilot of 15 years, my faithful hound who went through hell and back with me and his kitties. Kat’s descriptions of hound dog behavior and the endearing quirks they can develop rang true. If you’ve ever had a hound, you know that they will follow their nose even if it leads to pronounced peril or it means dragging you along behind them. They follow their noses, point blank, period. There are other laugh out loud funny moments in Pet Tracker like when you meet characters such as Barry the Boa Constrictor and Bret the Bearded Dragon, a real life rock star. There are also invaluable tips on how to properly search for missing pets. I am convinced that many feline lives could be saved if shelter workers understood how lost cats behave and shared that information with the public. It’s from Kat’s blog that I learned how cats, when sick or injured, usually hide nearby in familiar places, even inside the house they’re thought to have escaped from. She also offers wonderful pointers about the types of posters you should create when looking for a lost pet and how to conduct outreach. I feel even more strongly that cats should not be allowed to roam freely outside after reading this, for their own sake as well as that of other pets and wildlife. Our nation euthanizes millions of adoptable pets each year because no one claims or adopts them. This is abhorrent. I’m sickened by thinking of how terrified those innocent, loving dogs, cats, rabbits, and other pets are when placed in a stark gas chamber to die. Others are given lethal injections like serial killers just because their owner didn’t properly contain them, come looking for them, abandoned them, or cared enough to spay and neuter, creating thousands more like them. Or because they sat in a cage for a few days with people passing by and not giving them a second thought. This is particularly true for older pets, who are, ironically, usually house trained and more calm and disciplined than puppies and kittens. Every year King County, where Seattle is, puts several thousand adoptable pets to death. And this in a county of more than two million people. Animal shelters, for example, would hold a “stray” dog or cat for seventy-two hours, after which time they either adopted the animal out to a new family or destroyed it. So if a pet owner was not able to get to the shelter within seventy-two hours, their chances of a happy reunion were slim to none. The national “Return to Owner” (RTO) rate for lost dogs reclaimed by their families at animal shelters was sixteen percent. For cats, the rate is much worse—just two percent of stray cats held at shelters have someone show up to reclaim them. Pet Tracker is available on Amazon and as an ebook. More information about Pet Tracker and her training manual Dog Detectives are available on the Books page of her blog. Thank you, Kat Albrecht, and your amazing animals, for never giving up and making the world a brighter and safer place for so many people and their furry loved ones. I highly encourage others to become familiar with Kat’s work and to share her knowledge and expertise liberally. Who knows? You might be the next great pet detective, and it’s clear that those skills are sorely needed. When was the last time you walked into a business and wanted to go back because of the generic, cardboard treatment you received at the hands of an emotionless drone? Probably never, right? During my first full-time job back in the day I was introduced to business speak. I was listening to a female supervisor banter with some male business guests and felt incredibly awkward about the exchange. But the exchange was, by some standards, professional. It sounded like all parties in the conversation were reading lines from a Dale Carnegie seminar or the latest trendy book on sales that everyone bought because they knew someone else who bought it. My young mind thought, “that’s how people do business?” These people did not sound like they were talking to other human beings; it was more like they were trading superficial niceties with fancy, fashionable labels, accomplishing…? The stroking of an ego? Future opportunities to throw around more ’90s phrases? Anyone who knows me well is aware that I don’t do superficial. If someone walks up to me and politely sneers, “hiiiii, how are yooooouuu?” they should be expecting an honest answer. While on the phone, as a public servant, I’m not going to launch into a detailed description of my neighbor’s mishap with his Nutri Ninja the night before, I still cringe when, “to be professional,” I say, “good.” Because if I’m not good, I feel like a liar. Similarly, I feel that spending any amount of time sounding like I’m reading from a script during a business interaction is largely a waste. We’ve all done this dance. We exchange pleasantries, we toss around worn euphemisms, we talk about the kids’ sports and how the Seahawks are doing. But I believe everyone has a story. Everyone is unique and has something to give. To me a professional person is one who treats me as an individual and shows true caring rather than going through the motions of what they believe their bosses expect of them. The other night I was brainstorming terms that that can be synonymous with professional. I’m just going to share it as it came to mind, because I’ve both worked in places where some of these traits are expected and witnessed it as a client or citizen. Obviously there are jobs and situations in which we have to show restraint. We can’t create liability for our organizations by apologizing, showing too much emotion, or becoming overly involved. We have defined roles and protocols. But almost every contact we have is an opportunity to treat others like their problem and input is important– because it often is. If someone is being entitled or demanding you can always wait until you hang up or walk away to rassa frassa aahhhhh! !… and I openly admit to having my rassa frassa aahhh!! moments throughout the day. It’s no secret. I just have to ensure that I was professional enough to allow them to air their grievances (within reason) and make sure they felt heard. They took the time to call; even if they didn’t get the answer they wanted, they need to at least have the satisfaction that a fully functioning human being heard them out. Government employees in particular can get a bum rap for being staid automatons who are just there for the paycheck. Fortunately I work with hundreds of people who aren’t like that at all. My circles are brimming with personality and I love that. 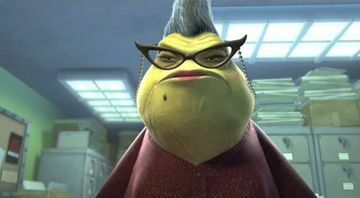 But once in a while you’ll walk into some agency where you find a little truth to the stereotype and think, “It’s Roz! From Monsters, Inc.!” In particular, people don’t like being treated generically or talked down to by those in authority. This can be a particularly sensitive issue in law enforcement because police officers have to maintain solid boundaries while interacting with all types of people. However, some of the most effective cops and other law enforcement employees I’ve known are those who command respect through being personable and committed to solving the problem at hand. Frankly, when you’re talking to them, you feel like you’re being taken seriously by a fellow resident of earth rather than simply being preached at or chastised by a superior life form. The latter may be seen as professional, but the former is infinitely better received by the public and causes both victims and suspects to open up. Having been a front counter person for many years, this same behavior can happen in that venue. When you walk up to get help, do you want someone to stare at the ceiling like Steve in Office Space and start in with a monotone, “Good evening sir, my name is Steve. I come from a rough area. I used to be addicted to crack but now I am off it and trying to stay clean. That is why I am selling magazine subscriptions.” If you’ve seen the movie you know exactly what I’m driving at. And– no! When I interact with someone at the counter I want to know who they are, how I can help them, and find something to laugh about while I’m at it. It creates rapport and fosters a mutual problem solving relationship rather than an adversarial one. I often notice people’s hats or t-shirts and strike up conversations about what’s on them. Inevitably we all know someone who knows someone who also stalks Bigfoot, served in a particular war, or enjoys being a walking billboard for a certain brand. Next time you’re at the store/renewing your tabs/mailing a package/reporting a crime/buying a suit/getting a new battery for your cell phone that seems to be inhabited by sadistic, power hungry micro-gnomes, ask yourself if you’d treat you that way. Seriously. Were you treated as an individual with a unique need? Was the interaction pleasant or would you have felt the same if strapped to the wall of an overcrowded squash court with a blindfold on and bad Burt Bacharach muzak playing? Ultimately, the question I’m asking is, “what feels professional to you?” Is it the generic, impersonal, outdated junk that’s been instilled in us from early on that we spew without thinking twice, or is it being human and helping other human beings find solutions? You already know the answer because you already know what speaks to you. Now go and do that, and watch how it transforms your relationships, your job, and your success. Remember that everyone you meet is afraid of something, loves something and has lost something. -H. Jackson Brown, Jr. 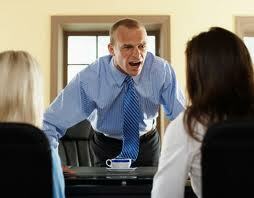 Bullying at Work: Workplace Mobbing is on the Rise | World of Psychology.